Was new Bulldog Tim English the draft steal of 2016? WHEN you're the reigning premiership winning team you can afford to be a little bold when deciding who to take with your first selection in the NAB AFL Draft. 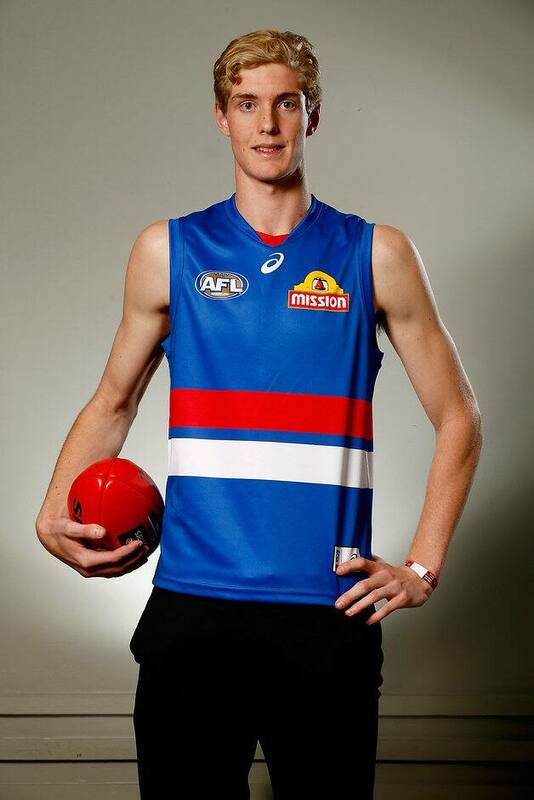 The Western Bulldogs have the list depth for a period of sustained success and adding the best ruckman in this year's draft , West Australian Tim English, with pick No.19, only enhances their chances of enjoying more silverware. Hailing from Pingelly in the WA Wheatbelt, English has perhaps the highest ceiling of any player taken on Friday night and that's why Bulldogs recruiting manager Simon Dalrymple was so delighted to snare him. However, AFL clubs are generally reluctant to use a first-round draft selection on a ruckman unless they really warrant that standing and the team has the patience to allow that player to develop at his own pace. The Bulldogs had that luxury. "We always thought that there was a chance that he might slide down the order because of that reason, but we felt that he was too good a player to pass up," Dalrymple said. At 205cm, English is the best ruck prospect to come through the system since Collingwood selected Brodie Grundy with pick No.18 in the 2012 NAB AFL Draft. English doesn't yet have the physical presence of Grundy, but what makes him special is his ability to cover the ground and play the role of a fourth midfielder and rack up possessions. And the beauty for the Bulldogs is that they can let the 19-year-old develop in the VFL for the first couple of years, with premiership ruckmen Jordan Roughead and Tom Boyd to hold down the senior position in the meantime. When English adds size to his upper body and can cope with the demands of AFL footy, the Bulldogs' will become even more versatile, with Roughead to push forward or back and Boyd to spend more time stationed inside 50. For a player his size, English has a rare skillset. The South Fremantle product can find the football at ground level, and often is seen scrapping at the bottom of packs, he backs himself to take the game on by hitting his targets by foot, and he can drift forward and take marks. English, who has been compared to West Coast great Dean Cox, averaged 17 disposals in six games for South Fremantle's reserves side (he also had a run in the seniors) and used the footy at 75 per cent efficiency. English's running ability has impressed, and at the NAB AFL Draft Combine he broke the 11-minute barrier in the 3km time-trial (running a final time of 10:55). It has been a sharp rise for English, who was playing school football for Christ Church Grammar in Claremont as a 184cm midfielder three years ago. A 20cm growth spurt in that time saw him rocket up the draft order, with English considered a candidate as a top-five pick earlier in the season. Since the start of the season, English has added eight kilograms to his frame – moving from 84kg to 92kg in the lead up to the draft. Although he has been been branded as a project player, English is hoping he will be able to push for senior football next year. For now, the Bulldogs are thrilled with their long-term investment in a player who may turn out to be the best young ruckman to be drafted to an AFL club in the last 10 years.